When pages of this remarkable textbook appeared on the Russian Internet, the publication was met with disbelief. Many doubted it was a genuine textbook that was actually used in American universities to teach Russian. Yet this was not a joke but the 700-page-long work of the late Alexander Lipson, a respected American Slavist, who produced it in the mid-1970s. The author deliberately tells simple stories making surreal fun of Soviet propaganda cliches and combining the satirical absurdity with elegant grammatical analysis. 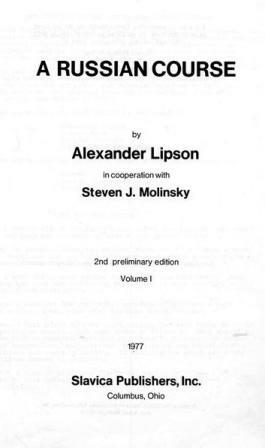 Lipson's book is credited to be the first to use the Jakobson one-stem verb system in teaching Russian; it also introduced many other concepts to Russian pedagogy providing the stimulus for a number of other books. Ударники живут хорошо. How do shock-workers live? It continues "Where do they work? They work in factories. How do they work? They work with enthusiasm. What do they do in parks? In parks they think about life. About what life? About life in factories. That's how shock-workers live!" The chapter continues with a discussion of бездельники, or loafers: "How do loafers live? At work they steal pencils. In parks they conduct themselves badly. Yes, comrades. That is how loafers live!" In later chapters there are choruses of male concrete-workers ("Our plant is a concrete plant. Our brigade is a concrete one. Our plant is a concrete plant. And our task is concrete. Concrete, concrete, concrete, concrete...") and discussions of philosophy ("What is life? What are people? I want to know what life is."). And what other textbook will teach you how to say "Comrade director, nobody loves me. Nobody understands me. I'm alone. I'm alone"? When I was in university, I took Russian for several years, and began with the strangest language textbook I've ever experienced, before or since. Lipson's A Russian Course concerns itself not with greetings and everyday life but with... shockworkers. Loafers who conduct themselves badly in parks. Concrete-mixers. Poor mad Olga who steals shoes from under the table. And the rousing concrete song. It was awful, for learning the language. Our next year saw a different, more realistic textbook, and we had to redo a year of Russian in a hurry. But I can't forget the songs, or friends nicknamed ударники and бездельники. I respond well to linguistic approaches such as the one Lipson pioneered for Russian. I used Lipson's books for 2 years, I really, really understand the structure of Russian in ways that those who learned from Soviet sponsored texbooks do not. His choice of vocabulary was pretty weird, though. I learned the word for "concrete mixer" before I learned the word for "airplane", for instance, because one of the dialogues we had to memorize concerned a lazy construction worker. Lo and behold when I got to the USSR I wound up working on a construction site. Full of lazy (and drunk) construction workers. Working on - you guessed it - the betonomeshalka. Allrussias.com has selected several pages from the textbook and provided them with illustrations. The complete scanned version of the course can be found here. Welcome to the wondrous and weird world of shock-workers and loafers (warning: people without a sense of humor should not use this book! Click below to upgrade your sense of humor if necessary).